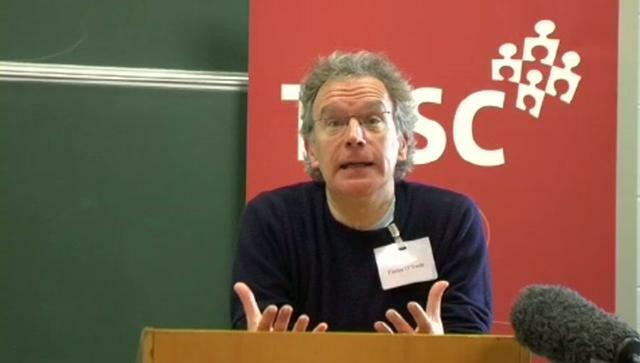 In the first part of our interview with Fintan O’Toole, he traced his career in journalism and the major influences on it, while locating those factors within the wider context of developments that have propelled our news media into its current form and function. Below, in the second part of the interview, O’Toole gives an in-depth assessment of the editorial ethos of mainstream news reporting – with reference to The Irish Times in particular. MB – Going back to what you were saying about the corporate nature of the media and the need to provide for advertisers, and in the context of a statement from the Editor which says that the Irish Times should lead and shape public opinion, is it just through gaps in the circle of political and media discourse that journalists are to lead and shape this opinion. How does this concept work in reality? FT – Well as I remember it, that quote from Geraldine Kennedy is part of a broader thing about what the Irish Times does. The context of it is in terms of talking about fairness and objectivity and indolence. I think it would be wrong to read it as we have an agenda etc. I also think in terms of the context it is quite an important thing to say, as it spells out quite upfront that the media do lead and shape public opinion. Why is anyone interested in this type of discourse if you don’t think you’re helping in some way to shape public opinion? One would hope public opinion isn’t shaped in any sort of crude or direct way. There is a broad debate going on around Irish society. I think it absolutely valid for a newspaper to state this is what we do in the context of the Irish Times. It is saying we have the capacity to be a campaigning newspaper as well as just simply engaging in some kind of narrow reportage. I think that is very important, and it is a progressive statement about what a media outlet can do. The idea of a newspaper having values seems to me very important to hold on to. What I believe Geraldine was trying to communicate in that was that there is a distinction between reporting and opinion. In the way you report you try to be as accurate and balanced and as fair as you possibly can. You try to give both sides of the story; you try to give the reader a useful and accurate summary of what has actually happened. We are all aware that the news agenda needs to be questioned, the selection of stories, the selection of values etc. But you can’t throw out the baby with the bath water – since it’s all so obviously compromised, it’s a method of maintaining the decent values of journalism. I do think the Irish Times tries to do that. Much of what is covered in the following interview will do little to reassure those who have lost faith in the ability of a medium beholden to corporate structures and external dependencies. The impression is of a closed circle of elites pampering other elites, while capitalism’s advertising-dependent media has it’s freedom “inevitably and inescapably circumscribed.”  There are some mitigating factors and Fintan O’Toole stresses that it is not a ‘crude’ formula. The Irish Times Trust, for one, makes the news outlet unique where Irish media ownership is concerned in that it has no shareholders – but this has it’s advantages and disadvantages. Fintan O’Toole gives a fascinating account of his experience of the Irish media and makes many illuminating observations about the way mainstream media works. We are grateful to him for the time and consideration he has given to the issues that we aim to promote for debate. 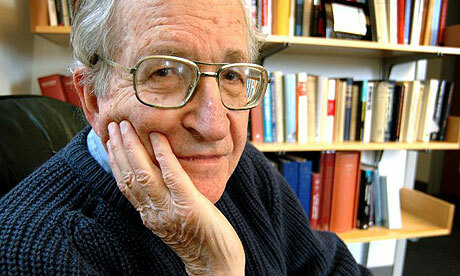 Professor Noam Chomsky has been voted the world’s leading public intellectual and is probably the most famous critic of US foreign policy alive. His books have been recommended by everyone from revolutionary Latin American leaders to school teachers. And he argues his point of view with an eloquence and rationality that makes it difficult to reconcile the inhospitable reception he often receives in the mainstream corporate media. Mark Little’s openly hostile interview that followed began poorly, with Little spending the first few of his 15 minute interview badgering Chomsky in the hope he would label Taoiseach Bertie Ahern a war criminal. It was unacceptable in Little’s eyes for Professor Chomsky to simply state his position as that concluded by the Nuremberg Trials – that the invasion of a foreign country is the supreme international crime, which encompasses within it all the evils that follow. It was up to the individual person to decide whether the Irish government’s support for the invasion of Iraq deemed the Taosieach a war criminal. The remainder of the interview was similarly inimical.